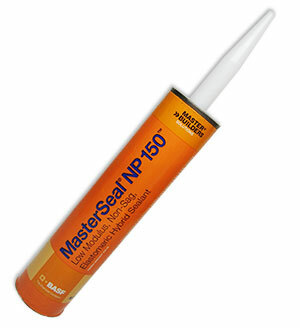 PRODUCT: MasterSeal NP 150 (formerly Sonolastic 150 VLM), WHITE Color, Very Low Modulus / High Movement Capable Sealant. 10.1 oz / 300 ml Tube. Price/Tube. DESCRIPTION: MasterSeal NP 150 (formeraly Sonolastic 150 VLM) is a premium grade, very low-modulus, high-movement, non-sag, fast-curing, ready-to-use, silyl-terminated polyether sealant. It combines the best qualities of organic and silicone sealants. Elongation of 800-1000%, 140-180 PSI tensile and +50/-50% joint movement to keep moving joints weather-tight. USDA Food service rated. Paintable. * Sound control / Acoustic Dampening / Acoustic walls. Skins tack free in about 1 hour at 75F. Use NT, M, A, G, and O. • ASTM C 1382 for use with EIFS wall systems.